NEW YORK (July 11): U.S. stocks closed broadly higher on Friday, with major indexes ending up more than 1 percent on hopes Greece would be able to secure fresh funding at an upcoming meeting, which would allow it to avert bankruptcy and remain in the euro zone. Indexes finished off their highs of the session after Federal Reserve Chair Janet Yellen said she expected the Fed to raise interest rates at some point this year, while expressing concern that the U.S. labor market remained weak. Investors have long expected a rate hike in 2015, though opinions have been split on whether it would come in September or December. Yellen gave no direct hint about whether the U.S. central bank would raise rates more than once over the course of its four remaining meetings in 2015. The day's gains were widespread, with all 10 of the S&P 500's primary sectors higher on the day. Euro zone finance ministers will meet on Saturday to decide on a third bailout for Greece, which made substantial concessions in its latest proposal to lenders, including tax hikes, in hopes of receiving $59 billion to help it cover debts until 2018. "Investors are betting that a Greek deal will be struck by this Sunday, and that reduction of risk is boosting stocks today. The removal of the risk of an exogenous shock means better market psychology," said Jim McDonald, who helps oversee $960 billion in assets as chief investment strategist at Northern Trust in Chicago. For the week, the Dow rose 0.17 percent while the S&P fell 0.01 percent and the Nasdaq ended down 0.23 percent in its third straight weekly decline. Equities were pressured earlier this week by a slowdown in China, weak commodity prices and uncertainty over the Greek debt crisis. Wall Street was also supported on Friday by a continued recovery in China's equity market, which was helped by a barrage of government support measures. Chinese Premier Li Keqiang said the country would make more targeted changes to its policies to support the economy and promised to increase the transparency of China's capital and money markets. The Bank of New York Mellon China's index of Chinese shares traded in the United States rose 2.4 percent. 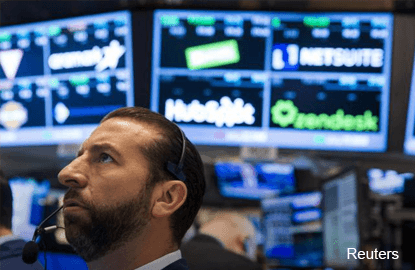 The Dow Jones industrial average rose 211.79 points, or 1.21 percent, to 17,760.41, the S&P 500 gained 25.31 points, or 1.23 percent, to 2,076.62 and the Nasdaq Composite added 75.30 points, or 1.53 percent, to 4,997.70. The U.S. quarterly earnings season kicked off this week, with Pepsi and Alcoa reporting better-than- expected sales. However, corporate earnings are estimated to have fallen 3.1 percent in the second quarter, according to Thomson Reuters data. Cablevision jumped 7.3 percent to $26.67 on a Wall Street Journal report that French billionaire Patrick Drahi was looking at cable targets for acquisitions. Zillow fell 7.7 percent to $78.67 a day after it said its chief financial officer was leaving to pursue other business interests. Advancing issues outnumbered declining ones on the NYSE by 2,456 to 623, for a 3.94-to-1 ratio on the upside; on the Nasdaq, 2,188 issues rose and 595 fell for a 3.68-to-1 ratio favoring advancers. The benchmark S&P 500 index posted 17 new 52-week highs and 15 new lows; the Nasdaq Composite recorded 83 new highs and 60 new lows. About 5.67 billion shares traded on all U.S. platforms, according to BATS exchange data, compared with the month-to-date average of 7.03 billion.